Give Your Guitar Playing The Boost It Needs And Deserves. So, if you want to be inspired to grab your guitar and play something exciting and really cool. And if you want to effortlessly ramp up your playing skills, and confidence. And, if you want to experience that look of total surprise and wonder, on the faces of your friends and family… then this classic Riffs collection, is for you! Now, if you’re anything like me, then you know that sometimes, making real progress in your playing, can feel like wading through treacle. You know, you get stuck in a bit of a rut, playing the same old things all the time, and the lack of time, focus and direction, can really bring your progress and motivation to a complete standstill. Well, there’s a quick and easy solution for you… get inspired and motivated, with these Classic Guitar Riffs! With this fantastic collection, you can have a blast, and experience a real boost in your guitar playing, in just 15 minutes. In the first of these 3 steps, I show you how the riff sounds, when played at normal speed, so you know what you’re aiming for. Also in this first step I share with you some tricks and tips on how to achieve the unique and authentic sound and playing style for each riff, so you can accurately re-create them and sound awesome. Then, in step two, I slowly take you through the riff, in real close up, section by section and note by note, so you don’t miss a thing and we practice each section as we go along, to make sure you’re 100% accurate. In step 3, we bring it all together and have a slow practice, so you can play along with me, making sure the riff is firmly embedded in your muscle memory, so your playing becomes effortless and error free. Then, you can slowly build up to playing at full tempo and enjoy jamming along with the great backing track, which will developing your rhythm and timing, so you can feel your confidence skyrocket. 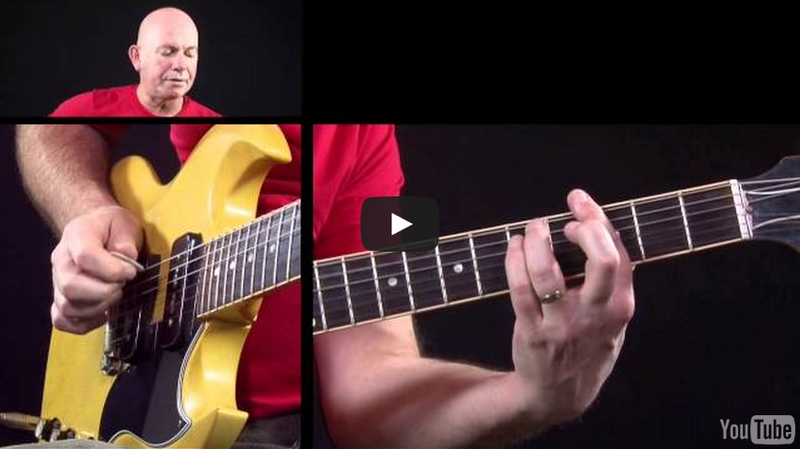 42 Classic Guitar Riffs And Over 6 And A Half Hours Of Step By Step Video Tuition. Sweet Home Alabama: Lynyrd Skynyrd. Wanted Dead Or Alive: Bon Jovi. With 3 teaching videos per riff, there’s a total of 128 multi camera videos in this collection, plus full tab and backing tracks – and it’s all downloadable, so you don’t need to be online to really have some fun. But if you prefer to have a physical product, we also have each of the Riffs Volumes on DVD too. So take a look below and you’ll see there are three options to access this Classic Riffs collection. You can access the digital version. Purchase the DVDs. 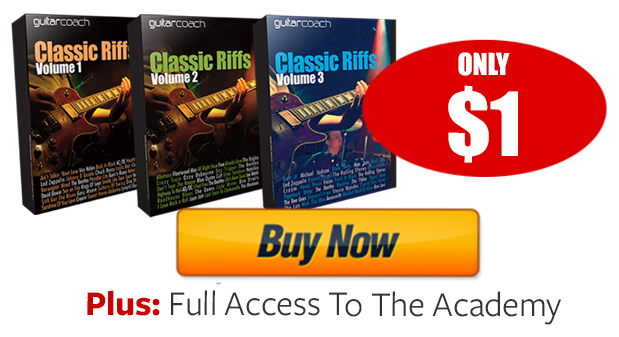 Or become an Academy Member and get the full Riffs Collection, plus access to all the other courses and programs within the Academy. 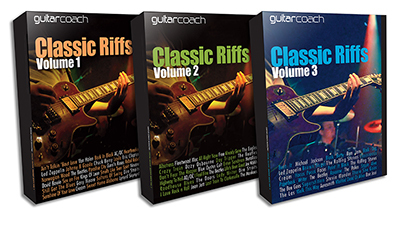 With this option you will get instant online access to all 3 Volumes of Classic Riffs. Plus you can download all the Videos, Tab and Backing Tracks if you wish. This is a single one-off payment for all 3 Volumes. Simply click the “Buy Now” button to get instant access. Option 2: DVD’s. Buy 2 And Get The 3rd One FREE! 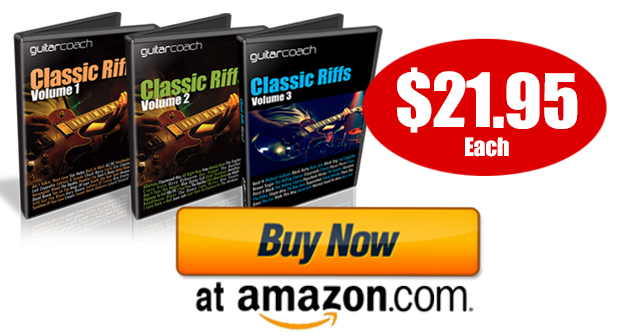 Get all 3 volumes of the Classic Guitar Riffs on DVD direct from Amazon.com. These DVD’s are ideal either as a gift, or for when you want to take your lessons offline, or just to keep them safe for future use. Each DVD contains MP4 Video files for all your Tuition, MP3 Audio files for the Backing Tracks, and PDFs for the Tab Books. Note: These DVD’s are for use on computers and not designed for direct use in DVD players or Games Consoles. The files on the DVD can be copied to your computer, tablet or smart phone. 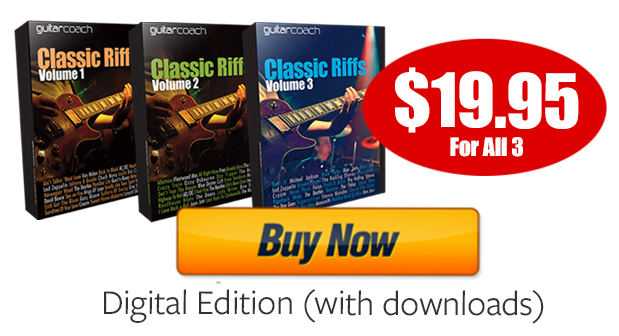 Get instant access to all 3 volumes of Classic Riffs, PLUS ‘Test Drive’ the entire Guitar Coach Academy for just $1! The Academy gives you access to the Classic Riffs Collection, PLUS a huge range of other great courses and video tuition. Try the Academy today for just $1 and get a full 30 days access to over 1,300 videos, and 65 hours of video coaching. If you decide to continue beyond the 30 Day Academy Test Drive, then you will be automatically charged the low monthly fee of just $9.95 per month for ongoing Academy access. You can cancel your Membership at anytime you wish using the Green “Help?” button on every page of the site. Click the “Buy Now” button for instant access. Plus your purchase is fully covered by our 30 Day No-risk, No-nonsense Guarantee. We want you to be really excited about playing guitar and having some fun. We want you to feel that boost to your motivation and to experience that look of surprise on the faces of friends and family as you effortlessly nail these classic riffs. But if for any reason at all, you don’t get inspired, or motivated. Or if this is just not right for you at the moment, then no problem, you’re covered. Simply click on the Green “Help?” button in the bottom right hand corner of this page and request your refund and we’ll immediately give you every penny of your money back that you invest today. Great Product! Looks like I got a lot of guitar playing ahead of me. Well presented package does what it says on the tin. All that remains is for me to set aside the time to practice! You can contact us any time by clicking on the Green “Help?” button in the bottom right hand corner of this page. This button is on every single page of the Guitar Coach site, so its quick and easy to get in touch with us, or request assistance.